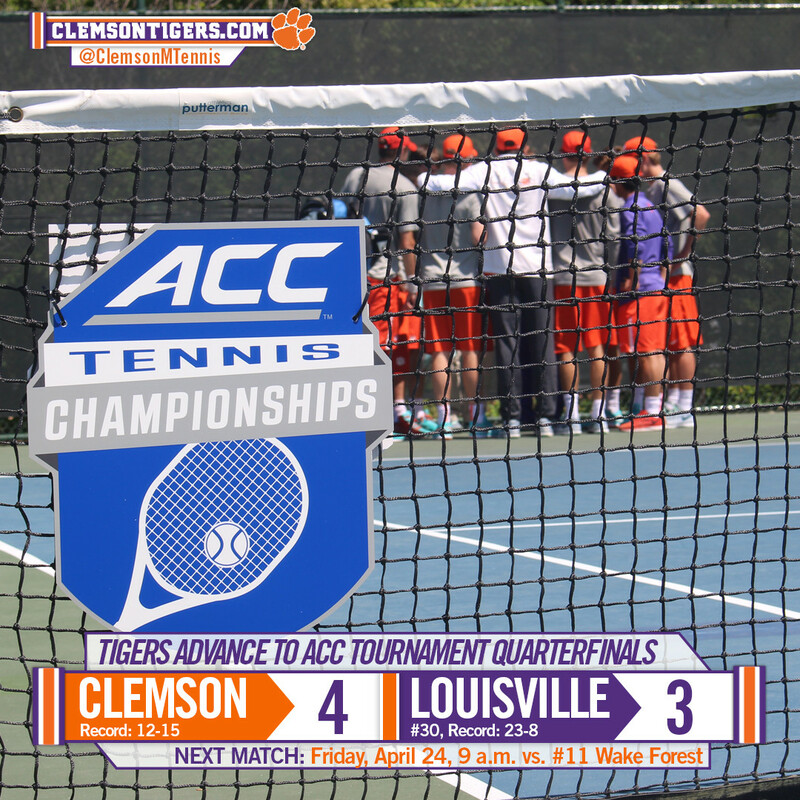 CARY, N.C. – The Clemson men’s tennis team upset 32nd-ranked Louisville 4-3 on Thursday morning in the first round of the ACC Championships in Cary, N.C. The No. 11-seed Tigers (12-15) won the doubles point against the No. 6-seed Cardinals (23-8) and then Luke Johnson, Alejandro Augusto and Hampton Drake won matches at No. 4, No. 2 and No. 6 singles, respectively, to claim the victory. At number-one doubles, Johnson and Hunter Harrington came out strong, starting outing their match with a lead, which they did not relinquish. The duo came out with an 8-5 upset over Louisville’s 82nd-ranked Brown and Gornet. Augusto and Austin Ansari, playing at No. 3 doubles, were down 4-1 before starting their comeback. After tying the match, the pair traded points with Simich and Stiefelmeyer before earning a break, and then serving for an 8-6 win to clinch the doubles point for the Tigers. Drake and Robert Dudley were tied at 7-7 and in the midst of a tiebreak at No. 2 when doubles play was halted. Johnson continued with his recent success in singles play, getting a quick 6-1, 6-4 victory over the Cardinals’ Simich at No. 4, and giving Clemson a 2-0 lead in the match. Daffra Sanon fought hard against Louisville’s Albert Wagner, ranked 95th nationally, falling in a close first set, 7-5, before dropping the second, 6-1. The Cardinals tied the match at 2-2 with a win at No. 5 and shortly after, took a 3-2 lead with a win at No. 1. At the top singles slot, Harrington put up a great effort against the nation’s sixth-ranked singles player, Sebastian Stiefelmeyer, falling 7-6(4), 7-5. Augusto, a senior, played with great heart in his match at No. 2 singles, winning his first set 6-4, and then gutting out a 7-6(5) tiebreak win in the second set to tie the match at 3-3. The final result came down to Drake on Court 6, who won an easy first set, 6-3, before dropping the second set in heartbreaking fashion, 6-7(6-8), after having an opportunity to serve for the win. After the second-set loss, the Clemson freshman rebounded with courage and fight, claiming a convincing 6-0 third-set win, along with the 4-3 Tiger victory. Thursday’s 4-3 win avenged a 5-2 Clemson loss to the Cardinals during the ACC regular season on March 29 in Clemson. With the win, Clemson advances to the ACC Quarterfinals, and faces No. 3-seed and 11th-ranked Wake Forest. First serve is set for 9 a.m. on Friday at the Cary Tennis Park.